KUALA LUMPUR, 16 May 2014 – Being fat may not be the most desirable look for most figure-conscious people but research carried out by scientists at The National University of Malaysia (UKM) indicated that being overweight could have some positive outcomes for males, such as having stronger bones and less likelihood for osteoporosis in later life. The UKM research team at the Faculty of Medicine which included Dr Elvy Suhana Mohd Ramli found that an increase in Body Mass Index(BMI) had a direct link with improvements in bone health, as assessed by bone mineral density and calcium ultrasonography. 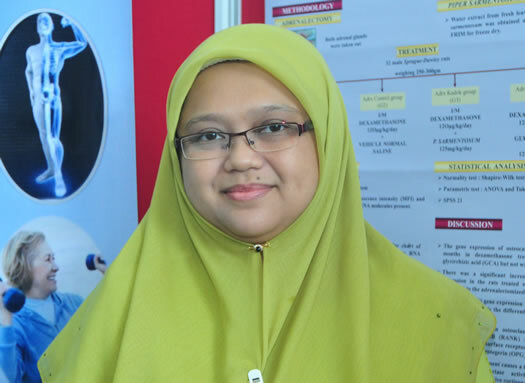 Speaking to UKM News Portal recently, Dr Elvy Suhana, a lecturer in Anatomy at the faculty, said increases in certain lipids or fats in the body stimulates the production of hormones that strengthens bones and helps prevent osteoporosis in later life. Osteoporosis is a major global health problem characterised by the loss of bone mass and strength which leads to an increased risk of fracture, usually in post-menopausal women. Her task was to compare the amount of lipids or fats in test subjects and the strength of bones. She said it was generally believed that the ability of human skeletal system to adapt to changes in mechanical loading or weight is also influenced by body fat via leptin, a hormone secreted by white adipocytes. The other researchers who took part in the study are Drs Kok-Yong Chin, Ima Nirwana Soelaiman, Isa Naina Mohamed, Fairus Ahmad, Amilia Aminuddin and Wan Zurinah Wan Ngah from the Departments of Pharmacology, Anatomy, Physiology and Biochemistry. The study was conducted as part of the Malaysian Aging Male Study aimed at assessing the various physiological changes of Malaysian men, particularly the Malays and the Chinese, across a broad age range. Using rats as a test subject and comparing the correlations to humans, systemic infusion of leptin was shown to increase bone mass of rats but intracerebroventricular infusion exerted negative effects on bone mass of rats. Hence, it is clear that our body composition exerted regulatory control on bone health by mechanical loading (via BMI) and leptin (via body fat). 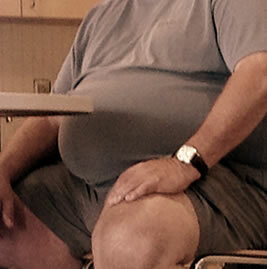 The body mass index (BMI) or Quetelet index, is a ratio of weight to height. The higher the BMI, the more overweight a person is. Recent studies revealed a possible reciprocal relationship between the skeletal system and obesity and lipid metabolism, mediated by osteocalcin, an osteoblast-specific protein. The study is aimed at validating the relationship between serum osteocalcin and indices of obesity and lipid parameters in a group of Malaysian men. A total of 373 men from the Malaysian Aging Male Study were included in the analysis. Data on subjects’ background, BMI, body fat (BF) mass, waist measurements, serum osteocalcin and fasting lipid levels were collected. It was found that the serum osteocalcin was significantly related to being overweight and the amount of fat in Malaysian men. There was a significant positive association between serum osteocalcin and high density lipoprotein (HDL) cholesterol. They came to the conclusion that serum osteocalcin was associated with indices of obesity and HDL level in men. However, Dr Elvy Suhana said that relationship should be validated by a longitudinal study with comprehensive hormone profile testing. The recruitment of men for the analysis was made between September 2009 to September 2011. A total of 840 men aged 20 years and above volunteered for the study of whom 373 had serum for osteocalcin and C-terminal telopeptide collagen crosslinks (CTX) assays. There were no significant differences between Malays and Chinese in their age, body anthropometric parameters (except height) and lipid profiles. However significant differences in serum osteocalcin and CTX were observed between the two ethnic groups. The levels of both the bone remodeling markers were significantly higher in the Malays compared to the Chinese. This indicated that the results should be adjusted for ethnicity.